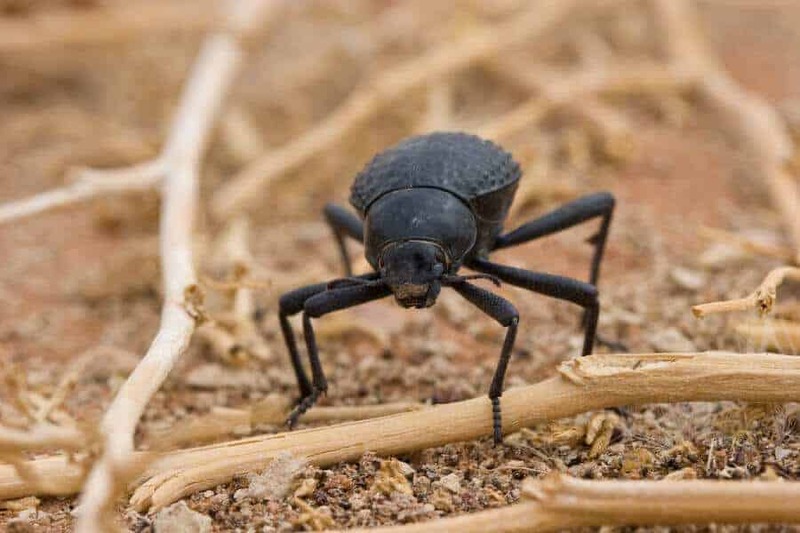 The toktokkie beetle is one of the best known of Namibia’s insects, with more than 200 species resident in the country, 20 of them living in the Namib Desert. The name ‘toktokkie’ refers to this beetle’s habit of knocking its abdomen against the ground as a means of communicating it’s desirability to a mate, and each species of toktokkie has its own unique tapping language to avoid confusion. The official scientific name for these creatures is Tenebrionidae, and they are also known as darkling beetles, which refers to their preference for gloomy habitats. Apart from their unusual love songs, darkling beetles have a number of other unique characteristics. Like many other creatures that call the Namib home, and particularly the desert-dwelling variety, these beetles have developed clever adaptations to make their life in this harsh environment a lot more comfortable. Thanks to their extra-long legs, the toktokkie beetles are among the fastest on earth reaching speeds of up to 90cm per second, which helps to avoid being scorched by the desert sand. These high speeds also generate a cooling breeze as the insect beetles along. Their thick chitin shells also contribute to keeping body temperatures down and they have traded in their ability to fly in favour of a wing-borne cooling and hydrating system. They respirate through a hole located under their wings, which cannot be spread for flying. Instead, moisture from their exhaled breath is trapped under the wings and retrieved into their bodies when they ‘inhale’ again. After the heat, a lack of water is the next obstacle which all desert creatures must overcome – no problem for the toktokkies of the Namib. One species, the fog basking beetle, ventures onto the dunes at sunrise to get their daily quota. They achieve this by climbing up a dune and performing a headstand so that moisture from the morning fog can collect along the length of their back, condense, and trickle down to their mouths. While another species, the button beetle, foregoes the acrobatics and digs small trenches in the sand to do the collecting for them. Food is no problem to these beetles as they survive quite happily on whatever the wind blows their way in the form of wind-blown plant known as detritus or beetle muesli. One of the best ways to get to know these and other small interesting desert creatures is on a desert tour at Swakopmund, located about 280 km from Windhoek.